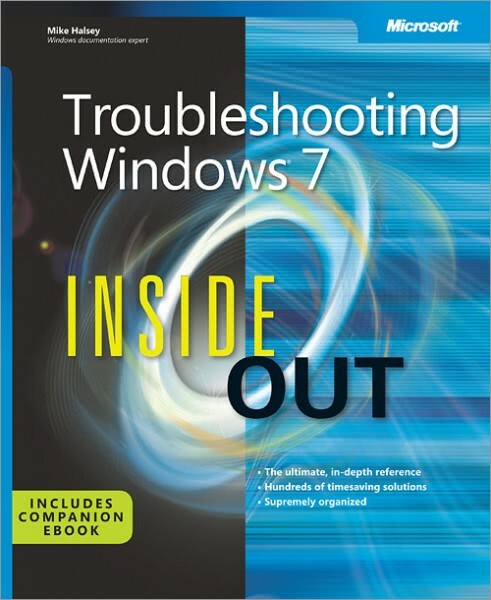 As the author of the Microsoft Press book, Troubleshooting Windows 7 Inside Out you might expect with a new version of Windows now upon us I’d be thinking about the next edition of the book. Well I couldn’t possibly comment on that but I do have an appeal to make. Please can you send me all your Windows 8 issues and problems. ;) I was very lucky with the first Troubleshooting book as there was very little, if any at all, competition in the market. This time around I would expect things to be very different as the book has sold well and received some fantastic reader reviews. So here’s an email address for your address books, mike@MVPs[dot]org and as you’re using the Consumer Preview of Windows 8, which remember still has bugs and problems in it anyway, or later on the RTM (Release to Manufacturing) version of the OS, please email me as you encounter either problems, bugs or issues that can prevent happy usage of the OS. …and also any suggestions you might have for things to go into a next edition of the book, should it even exist! Microsoft did a fantastic job with making Windows 7 as stable and secure as any other operating system on the planet (at least according to some security researchers, you may have your own ideas) and Windows 8, pending fixes to a few bugs in the beta at the moment, should be even better. However nothing is perfect and Microsoft have to support almost infinite combinations of software and hardware. That’s where you all come in as you will all run unique systems that will face their own problems as you mix your own hardware and software together with Windows 8. Any and all comments, suggestions and problems for inclusion will be most welcome. Thanks everyone.